Unlike 2015/16, this year's service will not extend into the New Year, and will not operate in the early morning (7:30 - 9:30am). 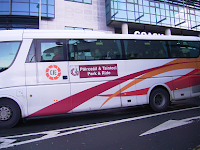 The flat-fare is €3 per car, This includes all-day parking, and return bus travel for as many passengers, adults or children, as were in the car. Buses use the most appropriate route between the race-course and the city centre. The service is non-stop, with no pick-ups or drop-offs along the way. See Galway City Christmas holiday bus services (coming soon) for information about regular city bus services during this period.